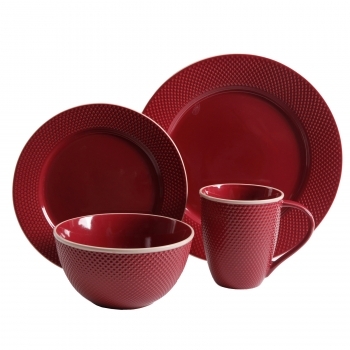 The Lilith 16-Piece Red Dinnerware Set by Gibson Elite is the perfect addition to any home. The delicate textured pattern and vibrant color will accentuate your table and your meals. Set the perfect tablescape and impress your family and friends with this bold and elegant dinnerware collection. Dishwasher and microwave safe for easy heating and cleaning.